a table, perfect for the patio. with these extra comfy lounge sets. 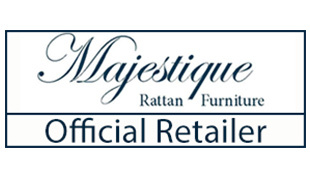 Majestique is a premium quality brand of rattan garden furniture, made from the highest grade synthetic rattan, hand woven over a strong aluminium frame, to ensure supreme durability and comfort on all sets. Learn more about Majestique rattan here. 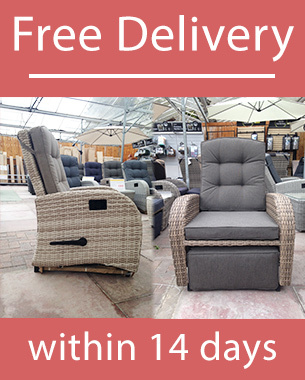 Why choose Reclining Garden Furniture? Comfort – the ability to recline the back of your chair gives you added flexibility and helps everyone find the perfect angle for themselves. 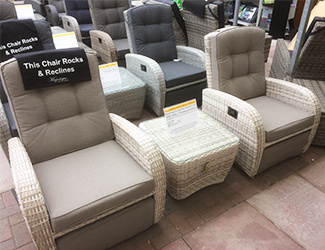 Support – the high backed chairs give better lumbar support, and the hand woven rattan cushions you gently. 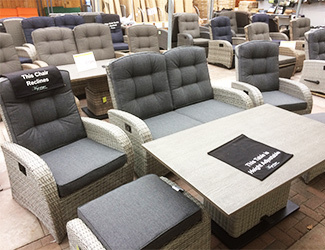 Durability – this all weather furniture can be left outside all year round, without the need for a cover. Colours – the synthetic rattan comes in a variety of colours that can suit any garden, from understated light browns and greys, to darker browns and blacks. 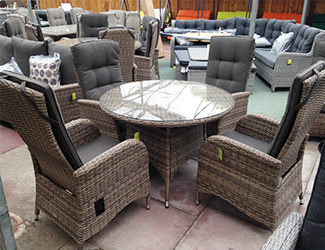 You can learn more about weatherproof rattan garden furniture here. 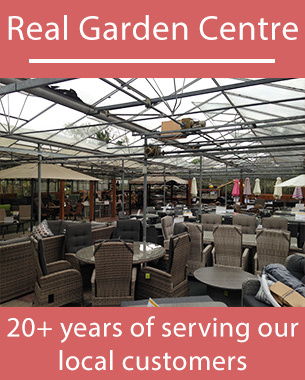 We supply a full range of reclining rattan garden furniture at our retail location. Come and visit to try a set in person!